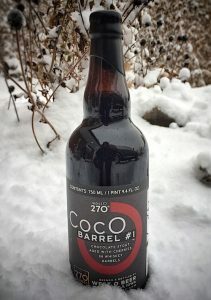 CocO Barrel #1 to Iowa Taproom! There is one keg of the very limited release CocO Barrel #1…you know, the barrel-aged-cherry-infused-awesomeness…slipping out our door and headed to the Iowa Taproom. So if you were bummed because you were closer to Des Moines than West Okoboji Lake when the bottle release sold out in 5 hours flat, here’s your chance to savor. Plan to hang around, because there will also be giveaways and meet-and-greet some of the West O staff, and stuff. That’s Friday, Feb. 3, 4 to 6pm. Iowa Taproom at 215 East 3rd Street in Des Moines. See you there. Bring your friends…they’ll thank you.